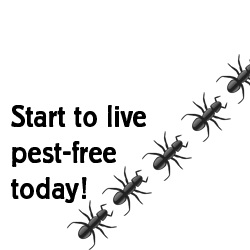 Are you ready to live pest free? This service consists of an initial visit to your home or business so we can evaluate your problem and give an exact price on what our service will be. The purpose of this is to determine what steps are needed to best serve your particular needs. Outlined below is a summary of steps we follow when we come to your home for a free inspection. Introduce ourselves in uniform and lettered vehicle. Interview you with simple questions to better understand your problem. To give you a thorough inspection including crawl space, basement, attic, every room of the house and outside perimeter as permitting. Draw a diagram on graph paper of the dimensions of your home with all problem areas labeled . Present this graph to you, explain the findings, and leave you a copy. Present and explain our service options to you. This complete process could take anywhere from 30 minutes to 2 hours depending on the size of your home and problems we may encounter. Our goal through this process is to educate you to make an informed decision about our services. For any questions please contact us or call us at (704)922-5500! Serving Gaston & all surrounding counties in the North & South Carolina.